I'm a bit puzzled as to what's happening on the roof of the school in the first panel of Joker's story above. At first I thought there was a large flower growing up there, but on looking closer there appear to be wisps of smoke above whatever it is. Is it supposed to be a lit fuse? This is the fifth raid carried out by our moneyed mate, bringing to 10 the total incursions into Whizzer by ex-Cheeky Weekly characters. Our Cheeky pals had been the victims of 19 raids by this stage. 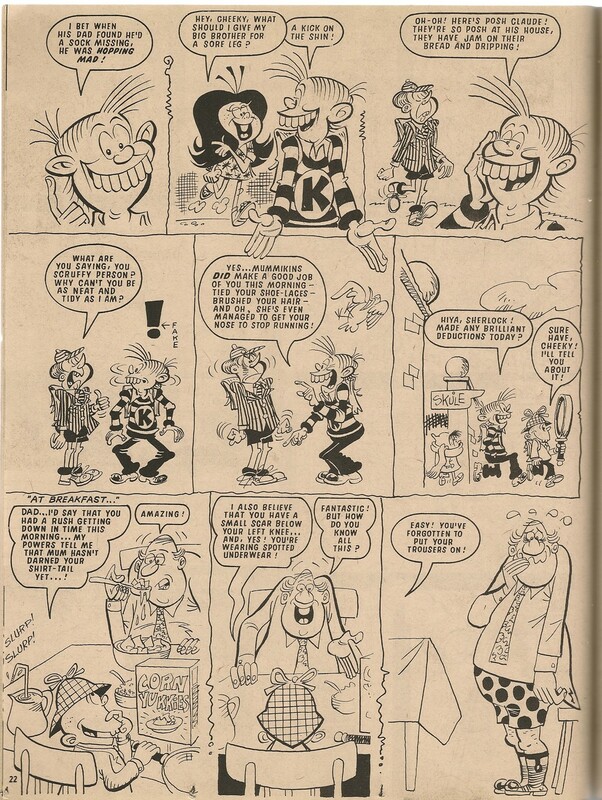 Cheeky, as a member of The Krazy Gang, transferred into Whizzer and Chips as of the issue dated 22 April, following the demise a week earlier of Krazy, the comic which spawned our grinning chum. 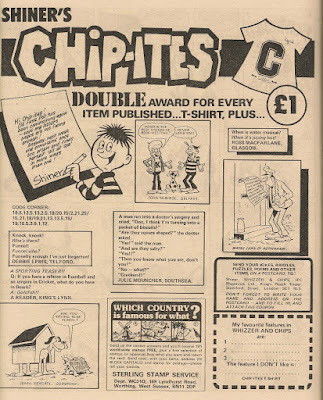 By the time of this Chip-ites letters page in Whizzer and Chips dated 02 August 1980, Cheeky Weekly had itself been defunct for 6 months and subsequently Cheeky's bifurcated comics career saw his solo strips decamp to Whoopee! 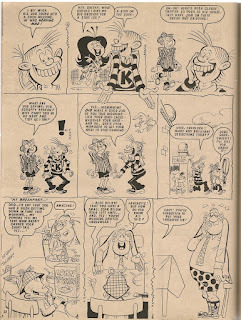 Included on this page is a rendition by Jim Crocker of the toothy funster. Unfortunately Jim left our gagster pal somewhat deficient as regards his jersey. Subtlety was never a priority for the creators of the multitudinous Cheeky's Week cast, so when the decision was made to include an aspiring detective among the ranks of the toothy funster's pals, said sleuth was equipped with a deerstalker hat, magnifying glass and named Sherlock. 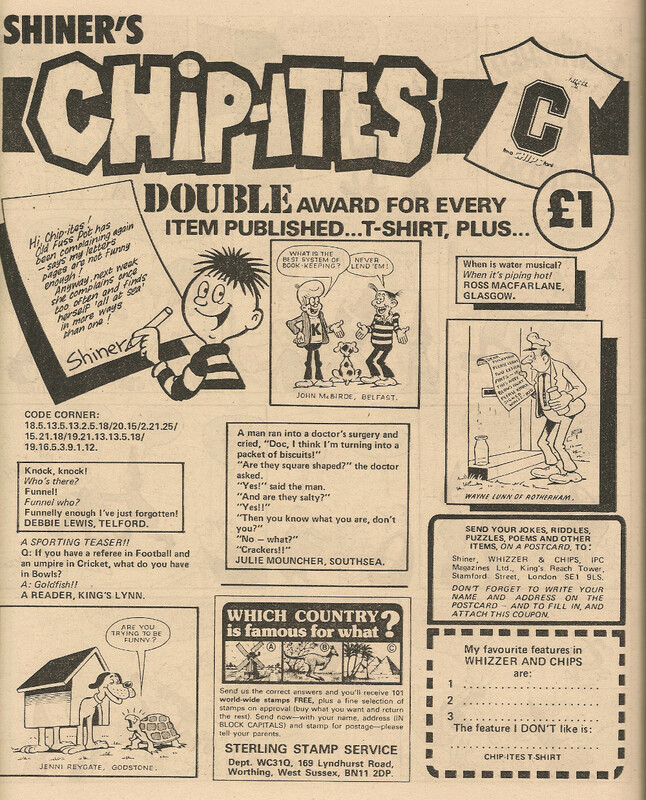 Cheeky's investigative chum made his debut in the first issue of Krazy. Sherlock's powers of deduction in his first appearance were positively Holmesian compared to those on display during his run in Cheeky Weekly. 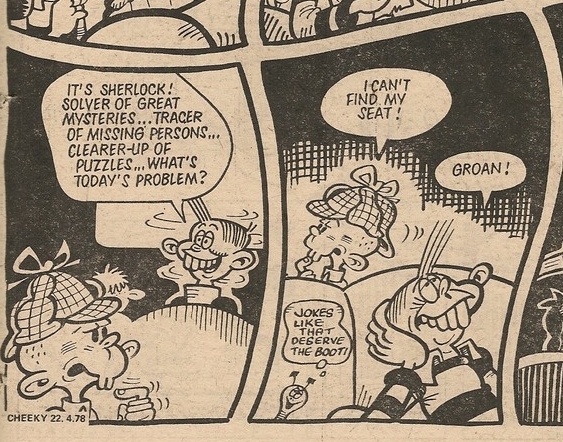 Although he did get a mention in the first issue of the toothy funster's comic, it wasn't until issue 7 that Sherlock actually appeared, cropping up on Friday and again on Saturday. In the comic dated 24 December 1977, Sherlock was hired by Nosy Nora to help her locate that week's copy of the ever-elusive Mystery Comic. 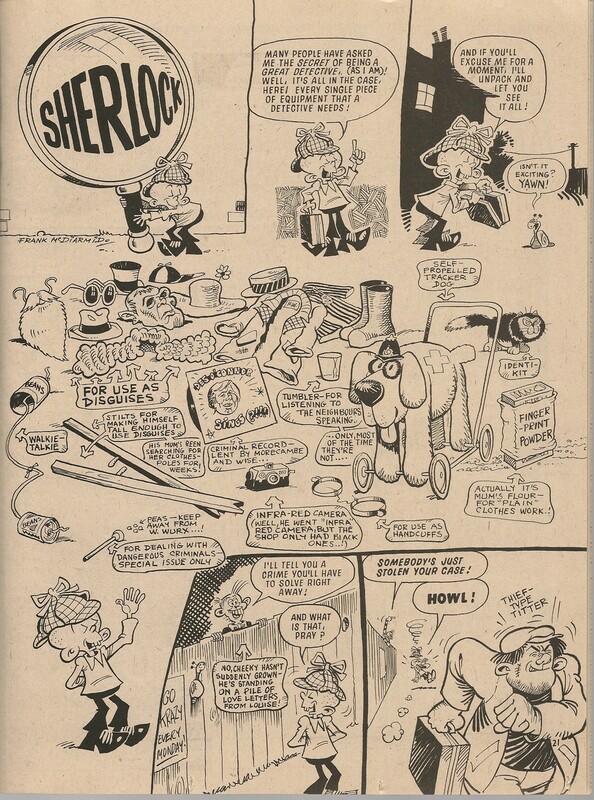 The issue dated 10 June 1978 featured Sherlock's first front cover appearance as he joined Cheeky in the What A Cheek strip. In the comic dated 24 June 1978 Petula recruited Sherlock to find a missing elephant, (no, not that one - his adventures didn't start until September that year) and the tiny 'tec's search continued in the following edition. Despite appearing on 5 pages in that issue, Sherlock was unable to locate the errant pachyderm, which had spent the week on Krazy Town High Street inside a cosy created for it by the agile knitting needles of Granny Gumdrop. 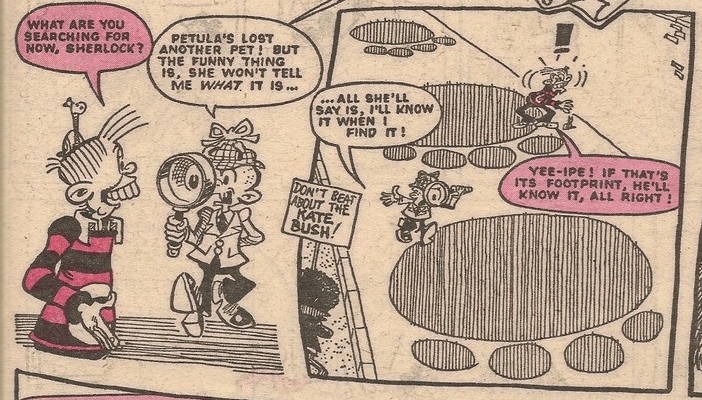 It seems that Petula was rather lax in securing her betrunked pet, as Sherlock was again on its trail in the comic dated 05 August 1978. The success or otherwise of his search was on this occasion not disclosed. ...sadly, the species of the missing creature was not revealed. 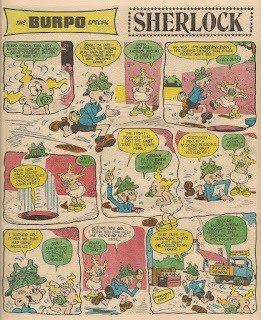 Sherlock had the honour of being the star of the back page Cheeky's Pal Puzzle in the comic dated 04 November 1978, and the junior detective's second and final cover appearance was on the front of the 17 February 1979 edition, where he was shown as a member of that week's Joke-Box Jury panel. 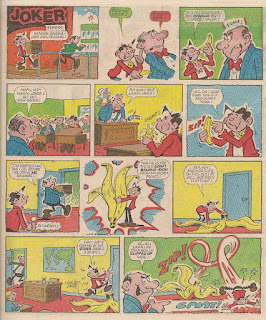 The youthful gumshoe was the subject of the Burpo Special in the comic dated 30 June 1979. 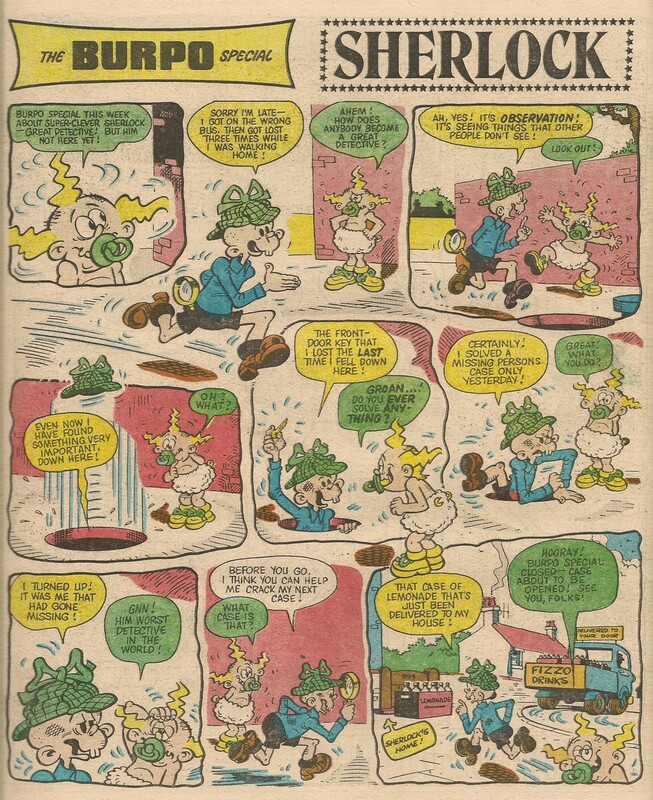 Prior to his appearance in Cheeky Weekly dated 31 December 1977, Sherlock was always depicted with pupils in the centre of his eyes, as are many comic characters. However in the aforementioned issue, Frank McDiarmid drew the junior sleuth's eyes as black ovals with no white of the eyes showing. 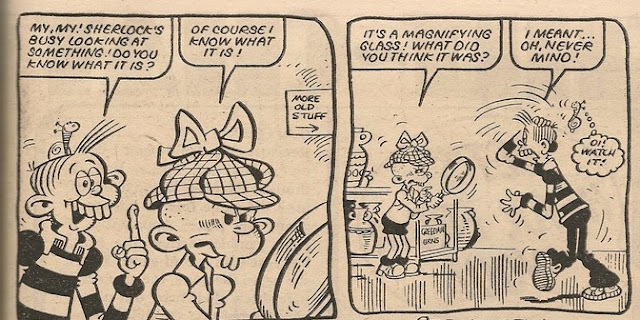 When Frank next drew Sherlock, on the cover of the 10 June 1978 comic, he included whites, but when depicting the young investigator on 5 pages in Cheeky Weekly dated 01 July 1978, Frank showed him on some pages with whites around his pupils and on others without. 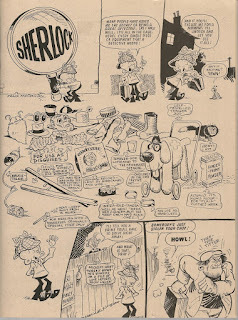 All Frank's subsequent renderings of Sherlock included whites. 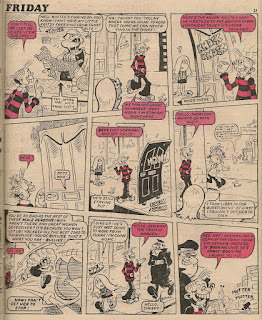 Mike Lacey always drew Cheeky's sleuthing pal without whites, whereas Barrie Appleby drew him on some occasions with and on others without. 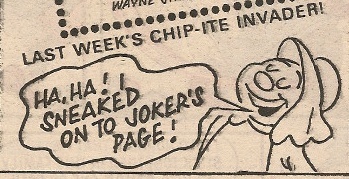 The daft detective's final Cheeky Weekly appearance was in the issue dated 19 January 1980, concluding a run during which he appeared in 47 issues. 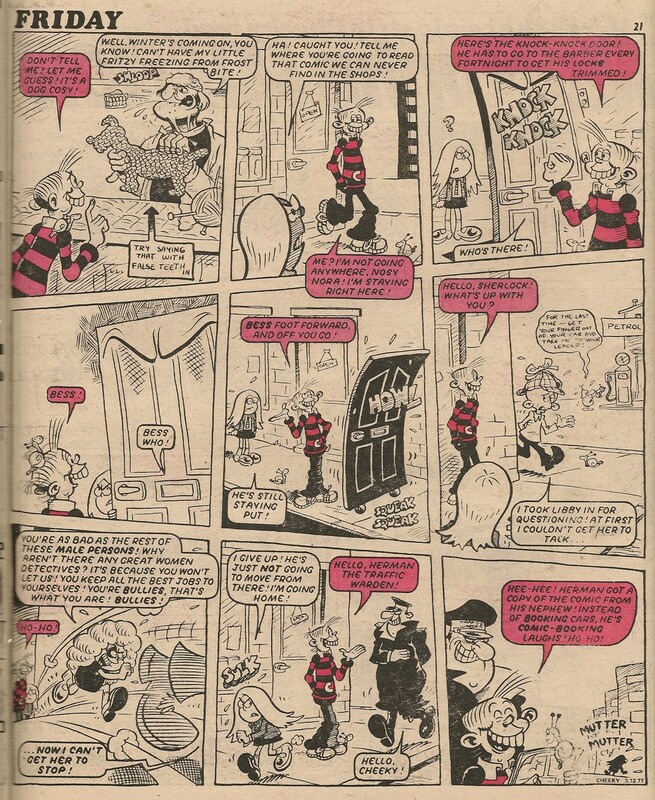 Bruce has posted some examples of Frank McDiarmid's Gasworks Gang strip from Cor! !